It has been just days after Kenyan rapper, Prezzo and Amber Lulu called it quits in their relationship. But Amber Lulu is still on the race, and she has landed onto another. The video vixen went after another´s husband and she is unremorseful, toward her victim, a nursing mother. 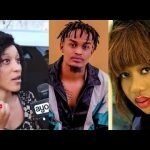 Tanzanian video vixen, Haitham, is her victim and this is what Amber Lulu had to say: Kwa nini mwanaume kamuacha yeye kaja kwangu. Hapo ndio pa kujiuliza. As if that wasn´t enough, she publicly tore apart her victim: Haitham kwa sasa ananyonyesha, ni vyema akajituliza kuliko kurusha matusi mitandaoni.Haisaidii maana huyo mwanaume kurudi kwake ni ndoto. The two video vixens have graced the battlefields before due to husband-snatching, with the victim being constant. The post Halegezi kamba: Amber Lulu snatches Tanzania´s video vixen´s man just days after dumping Prezzo appeared first on Ghafla! Kenya.